What problem is solved by the study? What potential new or altered instructional or institutional practices could be implemented on your campus or other campuses across the country?Is the new practice feasible? These efforts were to identify effective practices and further research. The results of these workshops and facilitated discussions are being developed and will be disseminated. May, 2017 | Workshop by Tanya Joosten and Rachel Cusatis at the Annual New Media Consortium Conference in Boston, MA. 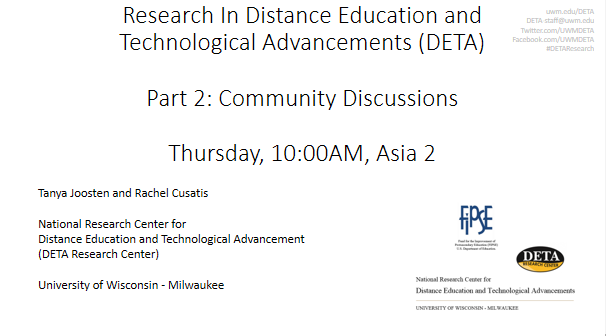 Build community among members of the field that are interested in research. 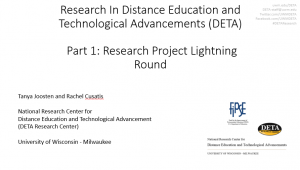 February, 2016 | Leadership Seminar: Promoting Effective Teaching and Learning Ecosystems via Research Proven Practice by Tanya Joosten, Diane Reddy, and DETA Research Fellows at the Educause Learning Initiative Conference in San Antonio, TX. 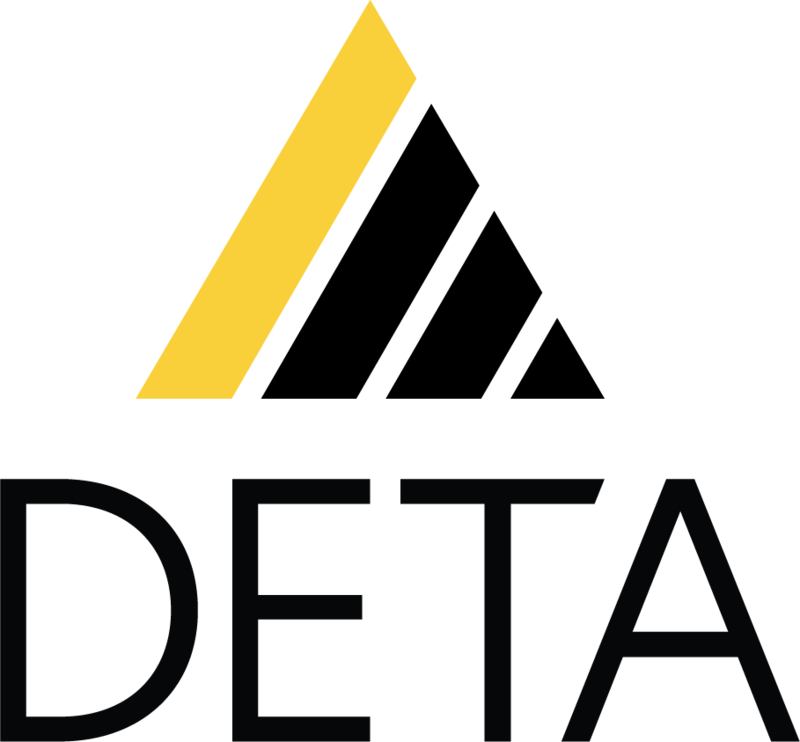 December, 2015 | Seminar by Tanya Joosten and Diane Reddy at the Online EDUCA in Berlin, Germany. 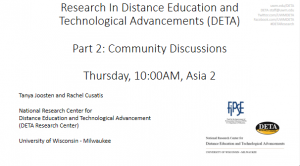 November, 2015 | Workshop to be facilitated by Tanya Joosten at the WICHE Cooperative for Educational Technology (WCET) Annual Meeting in Denver. 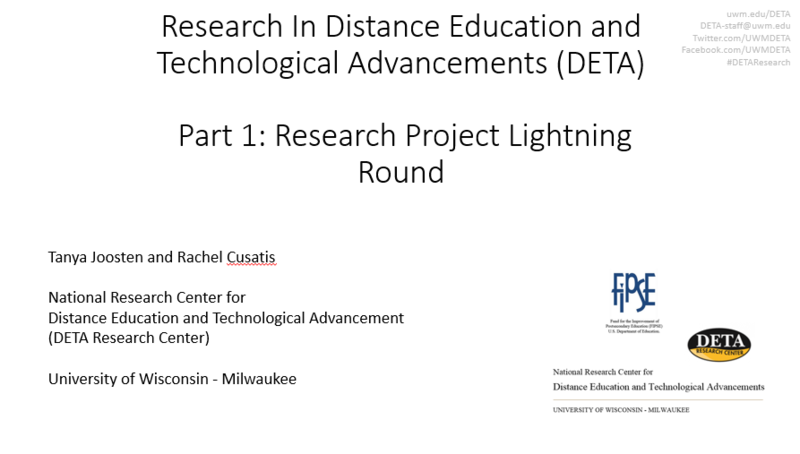 October, 2015 | Presentation by Tanya Joosten and Diane Reddy at the Online Learning Consortium (OLC) International Conference for Online Learning in Orlando. October, 2015 | Workshop facilitated by Tanya Joosten at the Online Learning Consortium (OLC) International Conference for Online Learning in Orlando. July, 2015 | Workshop facilitated by Tanya Joosten at the Online Learning Consortium (OLC) Blended Workshop and Conference in Denver. 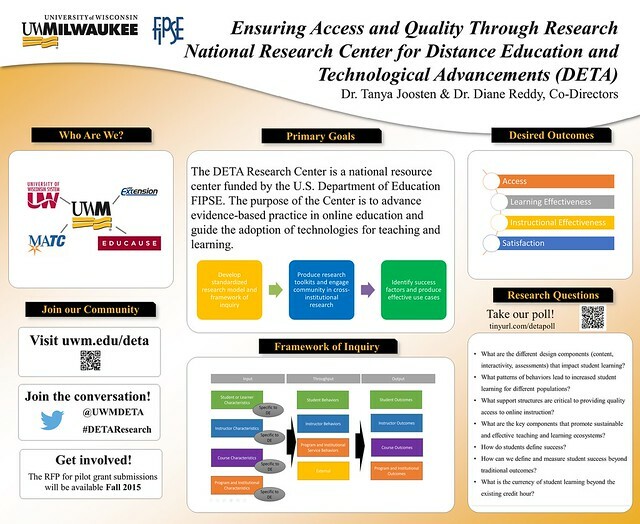 June, 2015 | Poster presentation by Tanya Joosten at the New Media Consortium Summer Annual conference in Arlington. Thanks to the Ashley Billig, Rachel Cusatis, and Lindsey Harness for poster and presentation design, development, and editing. 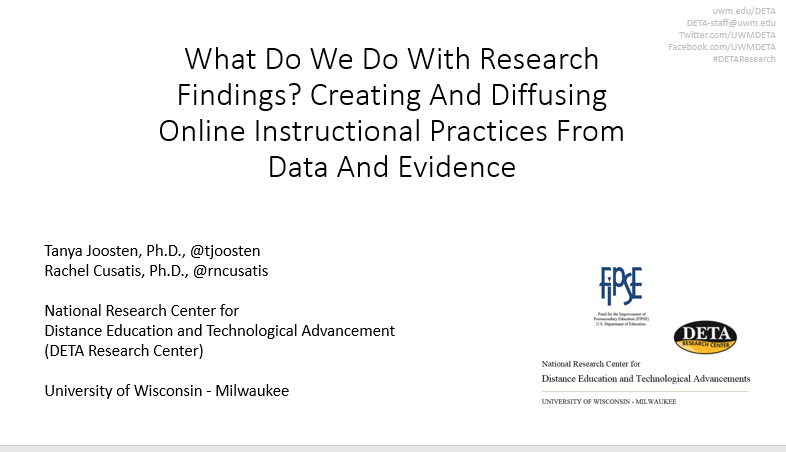 April, 2015 | Presentation by Tanya Joosten at the Online Learning Consortium Emerging Technologies Conference in Dallas. 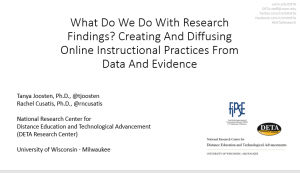 April, 2015 | Presentation by Tanya Joosten for an EDUCAUSE Learning Initiative Webinar.